Microsoft's Surface Pro 3 tablet appears to be a bona fide hit, according to Microsoft executives. In the company's positive earnings report, released Thursday, the company disclosed that Surface revenue topped $908 million for the quarter. It's likely the Surface business will top a billion dollars business before long. "Surface had strong results this quarter, driven by positive customer response to Surface Pro 3," Satya Nadella, the company's chief executive, told analysts and investors. "The product lineup is the right one and customers are responding favorably. Surface Pro 3 is now in 28 markets and importantly we have improved the business economics of this product line." Specifically, customers are snapping up the Surface Pro 3, which PCWorld reviewed favorably (and it's become this reporter's work PC, replacing his laptop.) But others apparently feel the same, too, as next quarter, Microsoft expects tablet sales to grow. "We are excited by Surface Pro 3 performance, as unit sales are pacing at twice the rate of what we saw with Pro 2," Nadella went on. 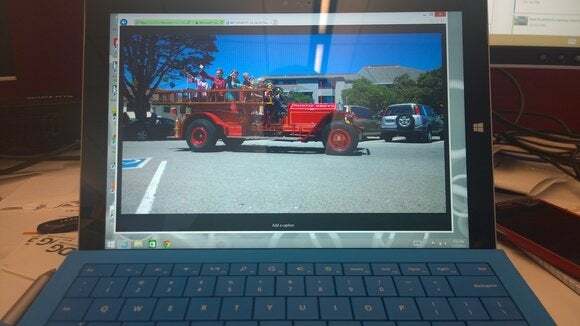 "We're seeing strong interest from students, professionals, and increasingly enterprises, who are replacing their laptops and tablets with Surface Pro 3 for their productivity needs. Gross margin for Surface was positive this quarter." Visit Microsoft's Surface site, and the Surface Pro 3 is virtually all you'll see: The Surface Pro 2 has vanished, and the Surface 2 is tucked away off to the side. Obviously, Microsoft would prefer that you buy the more expensive Surface Pro 3, and replace your notebook PC in the process. Now, however, it seems like the Surface has a head of steam behind it. Although Microsoft recorded $1.14 billion in expenses due to the layoffs associated with the Nokia acquisition, Microsoft said that it expects both year-over-year and sequential growth in Lumia units, driven by the midrange 500 and 600-series devices. Microsoft said it's eliminated the Nokia name on all but its feature phones, which will decline in both revenue and units, Microsoft said. As for the Xbox console, Microsoft said it expects units to grow, but that customers will increasingly prefer cheaper models. Nadella also reiterated that he sees gaming as strategic for Microsoft. "[G]aming is the one category we have said that we will invest in it for its own sake in driving enterprise value...There are, in fact, lots of benefits which come because of technology," Nadella said. He added, "the reason why we are so competitive now in Cortana and speech recognition...is it first started with Kinect and Xbox."